In spring, Pemphigus protospirae forms green, or green mottled with red, smooth galls formed by slight thickening, flattening and spiral twisting of the leaf petiole of Populus nigra (black poplar). The galls of Pemphigus protospirae have more than three, and usually more than five twists (see picture below, cf. 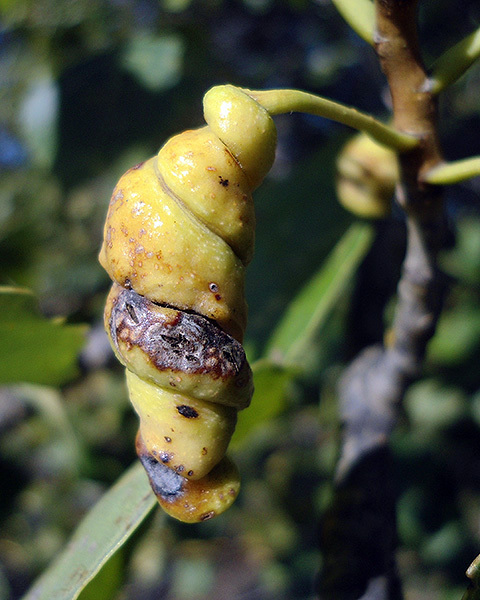 the gall of Pemphigus spyrothecae which is thicker and has 2-3 twists). The fundatrix that induces the gall has antennae about 0.2 × the length of the body and lacks siphunculi. Image courtesy of Dimìtar Nàydenov under a Creative Commons Attribution-Share Alike 3.0 Unported license. All the Pemphigus protospirae fundatrix offspring are winged. These offspring leave the gall during late spring to early summer (cf. the alate females that bear the Pemphigus spyrothecae sexual generation, which leave the gall from late August to November). Pemphigus protospirae winged migrants are greyish-green and lightly covered with waxy powder. Their antennae are 0.33 - 0.40 times their body length. The primary rhinarium on the fifth antennal segment is larger than that on the sixth, and is not fringed with hairs (cf. Pemphigus spyrothecae which has a small oval or rounded primary rhinarium on the fifth antennal segment, no larger than that on the sixth, and fringed with very fine short hairs). The most proximal rhinarium on third antennal segment is distal to the tooth. The number of secondary rhinaria on the third antennal segment is 10-14, on the fourth 2-5, on the fifth 2-4, and on the base of the sixth 2-8. Small siphuncular pores are present. Winged migrants of Pemphigus protospirae emerge from their galls on poplar in late May to early July and move to aquatic umbellifers (Apiaceae) as secondary hosts. Pemphigus protospirae is less common than Pemphigus spyrothecae, probably because it is restricted by the localized distribution of its secondary hosts. Pemphigus protospirae is widely distributed in Europe, across to west Siberia and central Asia.